Runners make their way along the dirt roads of Shelburne, Vermont, at last year’s Charlotte Covered Bridge Half Marathon. You’ll run through a piece of America’s maritime history at this race, run in a place with gorgeous views of the Connecticut coastline, where you’ll get to see plenty of historic ships in the Mystic Harbor. Run between tree-lined roadways and wide-open farm fields — no doubt part of the reason why famed Runner’s World columnist Bart Yasso selected the Iron Horse Half Marathon a few years back as one of his favorite races across the country. The vibrant colors of fall are on display for runners, walkers and relay participants all through Connecticut’s capitol city at this race, which features a mostly fast and flat course and features a stretch along the riverfront, including a run through the city’s Great River Park. You get to see what thousand flock here for every summer at this race, especially the rocky coastline along Fortunes Rocks Cove, Horseshoe Cove and Biddeford Pool, a large tidal pool off Saco Bay. Run through a Maine town where boats are said to outnumber cars, from the startling line at Blueberry Cove Camp to the winding back roads with views of the ocean crashing against the beaches and rocky shorelines. Run the only race of its kind that actually runs through the grounds of a U.S. national park, at a time when the autumn leaves are turning brilliant shades of orange, red and gold. 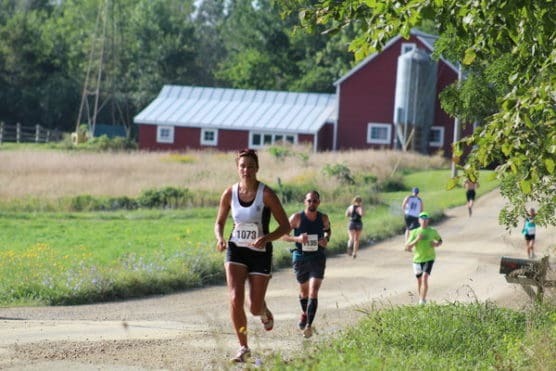 Run along the gorgeous, tree-covered hills and woodlands of Berkshire County in western Massachusetts, this race runs along the Ashuwillticook Rail Trail and its flat, 10-ft.-wide paved trail. Runners make their way through the streets of this Massachusetts city known as “the Witch City” for the infamous witch trials that took place here back in the early 1690s, largely along the city’s waterfront. Hailed by publications like Runner’s World and New England Runner as one of the country’s most scenic races, this half marathon unfolds on tree-lined residential streets along the shoreline of southern Cape Cod. If you know your running history, then you know exactly the significance that the small town of Ashland, Mass., plays in the sport’s most legendary race. It’s here that the Boston Marathon got its start (quite literally) back in 1897. The course for this race — which rises no more than 100 feet in elevation throughout — features views of some of the most quaint, picturesque parts of New England, taking runners through several covered bridges, most of which date to the pre-Civil War era. Perhaps most famous as the site of the first voting in the nation’s first presidential primary election every year, Dixville Notch is the home of this small-town race that usually coincides with the peak of the fall foliage season here in what is known as the Great North Woods region of New Hampshire. Run through the saltwater marshes, woodlands, and rugged coastline of Portsmouth Harbor at this race, which offers runners a scenic tour of Portsmouth as well as the nearby towns of Rye, New Castle and the harbor. You’ll run along the banks of the Providence River at this race, which features largely fast and flat terrain on both roads and bike paths, with gorgeous views of Narragansett Bay and the neighborhoods of this city throughout. With a breezy, sunny stretch along the Rhode Island beachfront, this race starts in and finishes near Misquamicut State Beach, one of the state’s more popular summertime beach resorts, and includes a stretch with the waters of Winnapaug Pond on one side and the ocean on the other. With its rocky shorelines, historic lighthouses and windmills that still stand as a reminder of the small coastal towns and villages of New England’s past, Jamestown and Conanicut Island make for a beautifully picturesque race. The rolling green hills, quaint downtown streets and college town atmosphere of this small city in central Vermont are just a few of the charms of this race, nicknamed “The Sweetest Half” and set for its 10th annual running. You’ll run through four of Vermont’s famed rural covered bridges at this 25-year-old race, which starts at the Suicide Six Ski Area in nearby South Pomfret and rolls through open farmland along the Ottauquechee River. Be ready when registration opens – it sells out every year in less than an hour. Surrounded by the rolling green Adirondacks and the deep blue water of Lake Champlain, this small Vermont race hosts a few hundred runners each year. Don’t forget to check out Shelburne Farms, a 1,400-acre National Historic Landmark, and the world-famous Vermont Teddy Bear Company. You’ll run through four covered bridges in Vermont’s Northeast Kingdom at this race which starts in Lyndonville, a small town of just over 1,200 in the state’s northeast corner, and finishes 13.1 miles later in St. Johnsbury. Held in this small northwestern Vermont town located here along the shores of Lake Champlain, this race features an out-and-back loop route that takes runners past countryside filled with rolling, green farmlands, tree-lined roadways and wide-open fields.